Event #7, the $365 no-limit hold'em event,has reached the unofficial final table of Ten. The players have redrawn for their new seats. Richard Wible leads the final ten players, with 330,000. The next closest players is Michael Hasbrouck, with 293,000. The remaining players are all guaranteed at least $1,041, and the first place prize is $14,418. Soukha Kachittavong bested a field of 183 entries to take home his first World Series of Poker (WSOP) Circuit ring, and $14,274. Kachittavong has many deep runs and wins in the Foxwoods poker tournament room, but this is his first WSOP win, and he said he feels very happy to have secured his first ring. “I have been feeling very confident this year. Coming into this year, I knew that it was going to be a great year for me,” Kachittavong said. Kachittavong felt so confident coming into this series that he actually made a ring prop-bet with a friend. His friend offered him 7:1 to win a ring in one of the twelve Foxwoods Circuit events, and today he not only won that ring, but an additional $7,000 on top! Registration is closed for Event #9, $365 no-limit hold'em event. This event drew a total of 178 entries, generating a prizepool of $53,400. The top 18 spots will get paid with a min-cash worth $715. The top spot will take home $14,418, the gold Circuit ring, and 50 Foxwoods Casino Champion points. Both players limp in pre-flop to see the Q♣8♠6♣ flop. David Gunas checks, Soukha Kachittavong bets 50,000, Gunas shoves all in, and Kachittavong quickly calls. "I think you are going to win this," Kachittavong says to Gunas. "I think so too. Do you think it will be on the turn or the river?" Gunas responds. The 4♥ turn leaves Kachittavong in the lead with his pair of queens, but gives Gunas additional outs. Unfortunately the 10♠ river is not one of those outs, and Gunas is eliminated in 2nd place, taking home $8,817. David Gunas announces that he is all in from the small blind (for around 425,000), and Robert Palazzo quickly calls in the big blind for his remaining 174,000. The flop comes K♠8♣3♥, leaving Gunas in the lead with his ace-six, but Palazzo picks up chop outs when the turn come the 7♣. Unfortunately, the river is the 2♥, and Gunas' kicker will play, to eliminate Palazzo in 3rd place. Soukha Kachittavong raises to 45,000 on the button. David Gunas folds his small blind, and Robert Palazzo shoves all in from the big blind for 196,000. "I am going to flop a set with this hand," Kachittavong says as he moves the chips forward to call. Kachittavong turns over 3♠3♦, and Palazzo shows 6♦5♦. Kachittavong is only in the lead until the flop comes A♥Q♥6♣, giving Palazzo a pair of sixes. The 8♥ turn and A♠ river are safe for Palazzo and he doubles up. David Gunas raises to 35,000 on the button, and Soukha Kachittavong calls in the big blind. The flop comes K♣5♠2♣. Kachittavong checks, Gunas bets 38,000, and Kachittavong raises to 98,000. Gunas pauses for a few seconds before calling. The turn is the A♣. Kachittavong bets 118,000, Gunas peeks at his cards and then mucks them. "Ok show the bluff," Gunas says to Kachittavong. Kachittavong says, "Ok, I'll show since I am a nice guy," as he turns over 8♦6♠ for eight-high. "That was a great card for you to bluff," Gunas says as the pot is pushed over to Kachittavong. 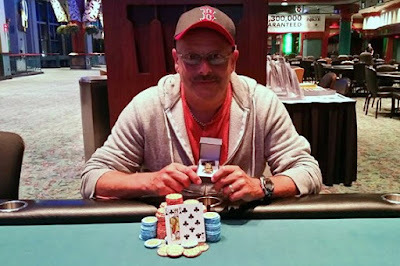 Andrew Chapman, a professional poker dealer and player, bested a field of 143 entries to win his first World Series of Poker (WSOP) Circuit ring and $12,012 in the Foxwoods Omaha Hi-Lo Event #7. Andrew and his partner Ashley just gave birth to this first child two weeks ago, a baby girl. "And to think this only the second best thing that has happened to me this month," Chapman said, "It feels great. Tournament poker is such a grind. You are happy anytime you make the money, you are happy anytime you make the final table, and to win it is just the pinnacle. After coming close so many times, all the work I have put into poker feels validated right now." Prior to today's win Chapman had three final table appearances in a row in this same event. He took 4th in 2014/2015 for $2,867, 2nd in 2015/2016 for $6,579, and today finally obtained the win he had come so close to the past few years. Andrew said that he credits Ashley for being a rock solid mom and continuing to be supportive as he took two days away from playing dad to play this tournament. Three players have bagged up their chips and will return to play Day 2 tomorrow at 1:00 p.m. They will return to play Level 22, with 6,000/12,000 blinds, and a 2,000 ante.